Honorable Mention: "Big Mac" (Mark McGwire), "The Say Hey Kid" (Willie Mays), "Double X" (Jimmy Foxx), Paul "Poison" Waner and Lloyd "Little Poison" Waner, "Dizzy" and "Daffy" Dean, "Donny Baseball" (Don Mattingly), "Rapid" Robert Feller, "The Chairman of the Board" (Whitey Ford), Willie "Pops" Stargell, "Junior" (Ken Griffey), Roger "The Rocket" Clemens, "Dr. K" (Dwight Gooden). On Monday, Page 2 ran its list of the best baseball nicknames of all-time. We asked for your take, and you filled our mailbag with plenty of opinions. After going through more than 2,000 letters, below is a complete rundown of the Top 10 vote-getters, along with some of the best letters about each nickname. And be sure to vote in the poll at left to choose the all-time best baseball nickname. 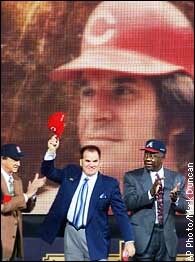 You have got to include Charlie Hustle for Pete Rose. If the guy can't get into the Hall, he's got to make the list. You can take away his credibility, his accolades, but you can't take away what he left on the field everyday -- everything. Anyone who sprints down the first base line after drawing a base on balls deserves a nickname like Charlie Hustle. It says it all about this guy. When he stepped on the field, he was the man. Sometimes seemingly playing among boys. From left, "Stan the Man," "Charlie Hustle" and "Hammerin' Hank" take part in All-Century Team ceremonies in 1999. Short, to the point, and a bit lyrical. I'm pretty sure that the expression "You the man!" was not widely used during Musial's playing career but it's contemporary meaning certainly applies to his excellent career. This man is the most overlooked truly great player in history. He was "The Man" in every sense of the word. The epitome of what Tom Brokaw calls the greatest generation, he could field, hit with power, and hit for average. On top of that, he was modest, a team player, and as close to a true role model as we have had in baseball. My vote is for is career accomplishments and for the accuracy of his nickname as it describes his character. How could you forget "Shoeless" Joe? It's probably the most colorful nickname in sports history, with a great story to back it up. What a great image, to love the game enough to play shoeless. Besides, a simple guy who loved baseball and got mixed up with the wrong people and never lived it down. To never be allowed to play ball again, and now to not even make the Page 2 honorable mentions for nicknames, it's a shame! People will come, Ray. People will most definitely come. 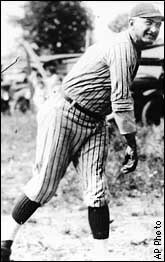 Page 2 readers wouldn't let "Shoeless" Joe Jackson be slighted again. Ruth was the first big-time home run hitter, and he was king of sports culture in the 1920s. Both parts of the nickname denote his power and his position as the most popular player in his era. The Great Bambino's legend has out lasted them all. He was a titan and his lofty nicknames were well-deserved -- and earned. Donnie Baseball (Don Mattingly), will always be remembered as the man who kept Yankee fans, Yankee fans...through the very lean years of mid- to late 1980s and early '90s. He played the game like an old-timer, and was able to touch all generations of fans! Nicknames should be simple (like "The Great One") and what's simpler than using the sport itself as a nickname? Also, to those who watched him in his prime, Mattingly was everything you wanted from a baseball player, so a perfectly suited nickname. Growing up a dyed-in-the-wool Yankees fan, one knew all of the great nicknames of the eras -- "The Babe", "Iron Man", "Scooter", "Catfish", "Donnie Baseball", etc., and their origin ... pretty much; but the sheer elegance in its simplicity of "Oil Can" along with the mystery of its origin, allowed this Yankees fan to think that the nickname of a hated Red Sox man was truly a classic. It wasn't until many years later, upon seeing an old, taped interview with Boyd, that the mystery was revealed. Seems that in the dog days of summer where he grew up and learned to play ball (somewhere in the deep south, I can't recall exactly), it would get so hot and he would get so thirsty that the beverage he would drink to refresh himself would go down very smoothly. "It was just like drinking oil [drankin' ole]." Again, classic. "The Splendid Splinter" was poetry in motion at bat. 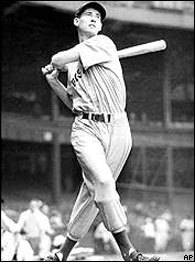 Note: Ted Williams also received votes for "Teddy Ballgame"
What Ted Williams could do with a bat was poetry in motion. Other players have bigger numbers but, even now, watching Ted swing the bat on grainy, old, black and white film shows a fluidity that few possessed. The reason I'm a baseball fan is because of The Wizard of Oz (Ahs?). No other shortstop could get to the ball as fast as, and utilize the fielders around him like Ozzie. When you can become one of the more popular athletes in baseball batting .260 and hitting one home run a season, you truly are a wizard. It is the only nickname added prior to the first name, no Big Units or Yankee Clippers -- fluffy imagery. Just that one added word that said it all about his career and accomplishments in the game. He epitomized grace under pressure and could hammer a ball in any position thrown. I was fortunate to watch him for a number of years in Milwaukee and really saw what a class act he was. You never heard about the death threats or negative press because he went about his daily business as one should -- with his mouth shut and his head held high. What I would give for more Hammerin' Hanks in today's crybaby game. Plain and simple when it counts, nobody -- nobody -- was better.